Summer Infant Complete Nursery Care Kit Discounts Apply ! The Summer Infant Complete Nursery Care Kit has all the baby items you need, and more. Many of the items in the Nursery Care Kit have soft, textured handles to provide a firm grip. Each baby item is held in place by an elasticized band inside the zippered storage pouch to keep things organized at home and on the go. 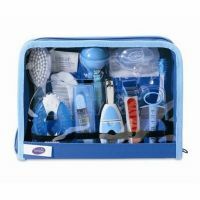 The Nursery Care Kit includes nasal aspirator, digital thermometer, strip with case, pacifier medicine dispenser, comb, brush, nail clippers, 6 emery boards, teether, gum massager, finger toothbrush with case, 5 alcohol swabs, emergency information card in a stylish storage case.